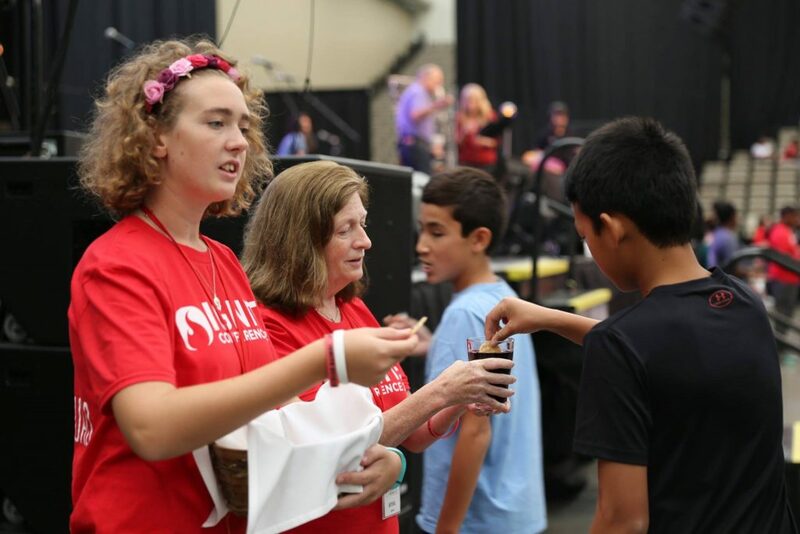 On October 2, World Communion Sunday inside the Wildwoods Convention Center auditorium was a sight to behold as throngs of young people left their seats and clamored through the aisles to receive Holy Communion. Over 1,000 young people, grades 6-12, from all over Greater New Jersey and the surrounding region, made their way down the walkways to receive the sacrament. The night before, hundreds of these same young people were moved by God’s spirit and made first-time or renewed commitments to follow Christ at the third annual IGNITE youth conference. Bishop Schol led the morning communion service along with 13-year-old Justin Teixeira, an IGNITE attendee from Titusville UMC. The two stood on stage before a crowd of over 1,200 and gave thanks as Schol presented a lively and animated liturgy. Justin, who is hearing impaired, participated in the liturgy with the assistance of Natalie Callis, a sign language interpreter from Waretown UMC. Throughout the country and the world, United Methodist congregations joined many Christian churches in celebrating World Communion Sunday. Whether in large or small churches, in farms or cities, ornate buildings, underground or under tents, millions gathered to receive the bread and cup of Holy Communion, celebrating unity in Jesus Christ. In the United Methodist Church, World Communion Sunday continues to be a special giving Sunday with monies raised to help provide scholarships for racial and ethnic minority students in the U.S. and throughout the world. Celebrating World Communion Sunday at IGNITE was special for those in attendance. The conference’s theme of “let there be light” was based on the Bible verse of 1 Thessalonians 5:5 which says, “You are all children of the light and children of the day. We do not belong to the night or to the darkness.” The weekend provided a variety of unique and fun ways youth experienced God. From hard-hitting bands, artists and speakers to an open mic acoustic coffee house, sports and games, laughing and sharing, writing and singing, times of prayer, breakout sessions and joyful worship, concluding the powerfully moving event with a time of corporate communion left hundreds inspired. As the communion service wrapped up and the conference let out, hundreds of students poured onto the Wildwood boardwalk. The sun emerged after a dreary weekend of rain and groups walked the boardwalk and beach hand in hand singing hymns and praises, reveling in the enthusiasm and motivation left by their memorable weekend together.